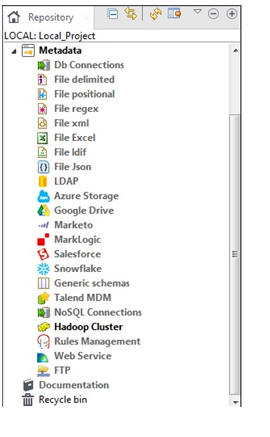 Talend Tutorial is used for Data Integration using ETL (extract, transform, and load) tool. Talend provides an open source software platform. It provides software’s solutions for data integration, application integration, big data, data management, data quality, and data preparation. It has a solution for all the products separately. It widely uses data integration and big data products. It is available in a premium version as well as in open-source. Talend can reuse and store the Metadata. In 2002, R&D was established for Talend. In 2005, the company created First round of financing AGF private equity and Galle Partners. In 2006, open studio V1.0 launched US operations. In 2008, Data quality opened profiler. In 2009, Integration suite RTx / MPx / MDM acquisition. In 2010, IDM Community Edition/MDM Enterprise Edition opened studio. In 2014, OW2 best project. In 2015, recognized the trendsetting product. In 2017, Gartner magic quadrant for Data Integration Tools. Talend can integrate big data easily using wizards and graphical tools. This allows an organization to develop an environment that can easily work with Spark, Apache Hadoop and NoSQL database for a cloud. Today companies use Hadoop for cost saving and to improve performance. Using Hadoop, data can be transformed, cleaned and enriched for a higher analytical workload. Data integration is a Talend software tool which has an open, scalable architecture and responses faster to business requests. It can easily integrate data with other data warehouses or we can say it synchronizes data between systems. Talend tool provides fast development and deployment of jobs than hand coding. Data integration combines stored data which are in different sources and provide a view of the data. It manages all the jobs of ETL and uses self-service and simple data preparation. Talend cloud integration offers tools for connectivity, built-in data quality, and native code generation. Cloud integration is used to accelerate the cloud and uses highly scalable and secure cloud integration platform for data integration projects. Talend is much-secured cloud integration platform. It also allows Business users and IT to connect and share on cloud and on-premise. The power of cloud design is unlocked because it can monitor, manage and control on the cloud. It has one or more Talend studios and also web browsers. Talend Studio allows the user to perform data integration processes. It is a very important block which has a web-based application server. It allows the administration and maintenance of all projects. It includes access rights, user account, and project authorization. The database includes administration, audit, and monitoring of database. It helps to manage user accounts, access rights and authorization of the project. It is a directory which stores all project folders. It is important to have per connection at least one workspace directory. It allows connecting various workspace directories if the user doesn’t want to use default directories. It is the storage area used for gathering data for business models or to design jobs. Talend open studio is an architecture for cloud integration, big data, data profiling, data integration and many more. It has a GUI environment which makes it easy to perform an operation like transform files, move, load data and also rename files. Its GUI environment has more than 1000 pre-built connectors. 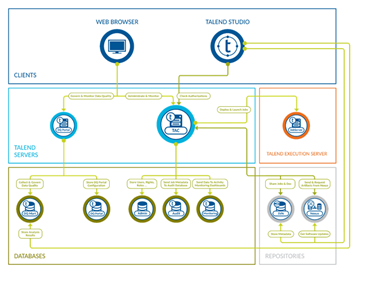 Talend open studio allows a complex process to each component. A business model is used to show higher management about what are you doing and also for the team for easy understanding. A business model is used at the beginning of data integration projects. The business model can be easily modified after or during the implementation of the project. Metadata means data about data. Metadata tells about what, when, why, who, where, which, and how of data. Metadata has all information about data which is present in Talend studio. Metadata is present inside the repository pane of Talend open studio. Metadata in Talend open studio is mainly used by drag and drop from the metadata in a repository panel. Its ETL tool allows quick development of the project to reduce development time and improve development efficiency. Its tool ensures product performance. Its tools are usually GUI based, and they are easy to use. It is an open source software platform which has data integration and data management solution. Big data integration with graphical tools and wizards is easy. Talend has 3 major products: i) Talend big data ii) Data integration iii) Integration cloud. Improves big data job design and also configure in a graphical interface. It has a software tool which has an open, scalable architecture. It allows faster responses to business requests. It has an open architecture for data integration, data profiling, big data, cloud integration and many more.